Episode #46: This episode we talk all about our favorite Jedi in each movie. Beau joins us on the main podcast for a little while and we later discuss some new figures. Episode #45: This episode Bryan and Carl ask their friend Dwayne to join them again. We all discuss what was announced at Toy Fair this year and what we think about it. Bryan and Carl talk about what they got in the past month and also what you might need to prepare for Star Wars Celebration. Bryan & Carl ask Dwayne to join them to talk about the best and worst in collecting for the year in review of 2018. Bryan and Carl talk about what they would like to have in the coming year released. They also talk about what they think might happen if Hasbro loses the license. Beau is back also to talk about some new stuff. Bryan and Carl have a couple of friends join them. Mike and Dwayne stop by to discuss the original 12 figures. This episode Bryan and Carl talk about what Halloween costumes were available back in the early days of Star Wars and a few nice ones from today. Bryan and Carl discuss what they got and all the announcements made from NYCC and what they think of all of them. Beau is back also to talk about some of the new forcelink figures. This episode Bryan and Carl welcome Dwayne back to talk about the figures we would like to see made or ones that are in desperate need of a remake. This episode Bryan and Carl celebrate the 10th Anniversary of the Clone Wars cartoon by talking about the Clone Wars figures. There are a lot of figures in this line. This episode Bryan and Carl talk all about SDCC and all the announcements that came out of it. We discuss what we like about the stuff coming and what we don’t like. This episode Bryan and Carl invite Kevin Lentz to join them and talk about how to best display your collection. Beau also joins to talk about the newest toys his dad got. 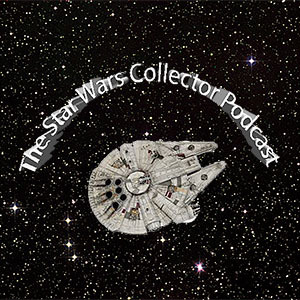 The Star Wars Collector Podcast #34: Han Solo? This episode is packed full of content. Bryan and Carl talk about the new Solo movie as well as Beau. We have our panel from Hero Con in Ashland, KY at the Highlands Museum. Beau also talks about the newest toys from the Solo movie and an older AT-ACT. This episode Carl and Bryan talk all about the new Han Solo toys and what they think about them. Beau makes a return to talk about the Han Solo toys as well. Bryan and Carl talk all about the animation series of the past and present. We talk about what we got this past month and what it means to us for Toys-R-Us to be closing. This episode Carl is taking the hosting reigns and Bryan sits back and relaxes, lol. We talk about the new toy announcements from Toy Fair this year and the new Solo trailer. This episode Bryan & Carl ask their good friend Mike Heicken to join us to talk about the life of collecting focuses. We also chat a little about The Last Jedi and get Mike’s opinion of what he thought about it. On this review episode Bryan and Carl are joined once again by their friend Dwayne to talk about the best and worst collectibles of the 2017 year. This episode Carl and Bryan talk about all the stuff we got for Christmas. Beau is back to talk about some of the toys we got for Christmas. We also discuss The Last Jedi and what we thought about it. Bryan and Carl this episode talk all about Christmas stories past. Beau is back to talk about the 3 pack from Target and the BB-8 playset. Also Patreon members will get a patch if the sign up for at least 4 months at the $1 & $2 level and after 2 months at the $5 & $10. This episode Bryan and Carl talk about stuff we have gotten over the last month. We talk about some of the figures we think either need an update or need to made for the first time. In this episode Carl and Bryan talk about the new stuff they got and the main topic is all about the Vintage Collection figures. Also we announce our winners of our contests. Beau is back as well to talk about some of the new figures. What is this? Another new episode already? Yes indeed, we are here again. Bryan and Carl are joined once again by our good friend Dwayne Steele again to talk all about the new The Last Jedi toys that came out on Force Friday II. We have interviews with those in line with us from Toys-R-Us and Beau is back to talk about the new toys too. On this episode Bryan and Carl talk about what is about to come out for Force Friday II. Bryan talks about his experience at GenCon and Carl talks about his experience at Wizard World. The main topic is about the tabletop games of Star Wars past and present. This is Bryan. Justin, who is a friend of mine accompanied me to GenCon and played in the same events as me. GenCon is an experience like no other gaming convention. For those of you that have never heard of it, it is one of the largest tabletop, miniature, card, dice, and rpg gaming convention in the world. This year happened to be the 50th convention of GenCon. This was my 2nd GenCon. I had the opportunity to play in the North American X-Wing Championship. I didn’t do very well but still had a lot of fun. Also I played in a team epic event with my friend Justin and we ended up losing a close match, but this was our first time playing this type of event so it was a real learning experience and the two guys we played were really great at helping us learn the rules. The prizes for winning this event were range rulers, that our opponents said they already had and told us to take them. That was absolutely not necessary but totally appreciated. This type of event is very casual and made for a very fun day. There is so much to take in that you could spend the entire convention just demoing games and looking around the exhibit hall. There are several companies that have multiple games being sold and demoed for the first time here. Fantasy Flight Games has stuff available that is still not available to the general public. They had Hired Guns for sale which is for the X-Wing miniatures game that probably won’t be available until some time in September or later. So that is my general overview of the time I spent at GenCon. It was a lot of fun and I plan on going again next year. Hopefully I can set up some interviews with some of the companies for the game I play. Hope to see you there next year which is taking place once again in Indianapolis, IN at the Indiana Convention Center Aug 2-5 2018. This episode is jam packed with lots of announcements of new products coming from D23 and SDCC. Bryan and Carl also talk about the Freeze Frame figures that came out back around 1998 time period. We also have Beau back again doing some more interviews. This episode Bryan and Carl talk about their favorite Star Wars websites, the new director of the Han Solo movie, and some new stuff they have gotten. We also have interviews with some of the local collectors from the KSWCC group including Beau. Star Wars is now the big 40, so we discuss some of our memories and favorite things. We also talk about the state of collecting and how hard it is to find stuff in the stores. In this episode Carl and I (Bryan) discuss The Last Jedi trailer as well as give our thoughts on it. We also talk about the stuff we got and I tell the good and bad again about Celebration along with what Carl heard from afar as we (Stephanie, Beau, and I) had to endure the long lines. This episode is all about my (Bryan) experiences at the 2017 Star Wars Celebration in Orlando, FL. I have interviews with fellow podcasters as well as other attendees including my wife and son. Hope you enjoy this special episode and we will have another regular episode in about a week or so. In this episode, Carl and Bryan ask their friend Kevin Lentz to join them in discussing the different Vintage Star Wars Cardbacks. We also found out some of the exclusives that will be available for Star Wars Celebration. If you are going, find Bryan and ask for a special pin with The Star Wars Collector Podcast logo on it. This episode Carl and I talk about the new stuff announced at Toy Fair, our first Patreon donor, and the Orange carded Power of the Force 2 carded figures from 1995-96. Thanks to our first Patreon donor Melanie for her donation. In this episode we discuss some tips on what you need to prepare for a big convention since Celebration Orlando is coming up in a few months. We also talk about Episode VIII and the title that was revealed. This episode we invite our friend Dwayne back to help us talk about the best and worst collectables for the 2016 year. So, sit back and listen to us and enjoy. This episode we say goodbye to a beloved lady and a huge part of the Star Wars Galaxy, Carrie Fisher, aka Princess Leia. We also talk about stuff we recently got and about the new Star Wars movie that just came out, Rogue One. This episode which is our 12th episode, we talk about all things Holiday, the Holiday Special, Christmas ornaments, and music. I got a lot of new stuff and the news for new collecting announcements is plentiful. Don’t forget to rate our podcast on itunes, check out our Facebook page, and our Patreon page. Thanks. This episode Carl and I talk about the new Rogue One trailer and some of the new stuff we have gotten since the last episode, which isn’t a lot. Also at the end of the episode I sat down with The Man Who Shot Luke Skywalker, Kim Simmons to talk about his time doing the art for the toys. In this episode we invited Topps Sketch artist, long time podcaster, Dan Curto to join us and talk about the new Rogue toys that were released. Carl and I also talk about the recent KSWCC Fall Festival that happened and what we got. This episode is full of all the toys from Rogue One and all others that will be released over the next few months. We also discuss our favorite movie and some memories of when and how many times we saw them. In this episode Carl and I discuss conventions that we will be attending, all the Lego sets we have and the history of Lego Star Wars, and lots of other stuff. Enjoy. Don’t forget to give us a rating on itunes so that we can move up the feed. Thanks. This episode Carl and I talk about collecting cards old and some new. We also discuss the fact that nobody can find any stuff in the stores and new stuff we got. This episode we discuss some of our vintage toys that we have gotten over the years and what we had as a kid. We of course discuss what we got over the last month and what is going on with the club meetings. Listen for a chance to win a free C-3P0 comic as well. On this 5th episode of The Star Wars Collector Podcast we discuss new items we have found, the state of collecting these days as opposed to the past, and Star Wars video games of the past and present. This episode we discuss the new Star Wars & Darth Vader comics issues 1-6 of each. Also we talk about what stuff we got in the past month. In this episode we discuss the state of collecting in the stores. Also we talk about those special holiday themed toys and items that we see all over the place. This episode Carl and I discuss some new figures that are coming out and some of the stuff we got since our last episode. In our main discussion we talk about the news of Episode VIII getting pushed back to December and the new movie coming out this year, Rogue One. In this first episode we talk about ourselves and what we collect to give you an introduction about us. We also talk about what we recently got for Christmas and just in general. At the end of the episode we talk about the new movie that came out, The Force Awakens, and we do have spoilers in it.